Tonight at 7:30 p.m., the American Cinematheque's Aero Theatre in Santa Monica will be presenting two Audrey Hepburn movies of the '60s: Blake Edwards' romantic comedy-drama Breakfast at Tiffany's and Stanley Donen's offbeat comedy Two for the Road. 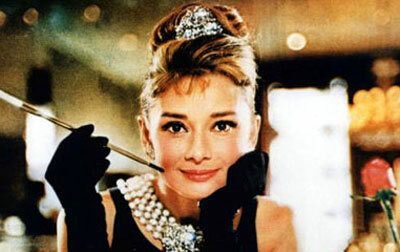 In Breakfast at Tiffany's (1961), Hepburn plays Holly Golightly, a bowdlerized, desexualized version of the female heroine found in Truman Capote's original novel. At first, the role was reportedly intended for Marilyn Monroe, who would have been a better choice had the filmmakers actually bothered adapting Capote's novel. As it is, Breakfast at Tiffany's is conventional but enjoyable fare. George Peppard is the leading man, Mickey Rooney is a politically incorrect East Asian stereotype, and Henry Mancini's “Moon River” is the film's Oscar-winning song. Now, it's just too bad that Patricia Neal's role wasn't larger; although Best Actress Academy Award nominee Audrey Hepburn is perfectly fine as the ditzy Holly, Neal would have easily stolen the movie. George Axelrod was credited for the adaptation. Written by Frederic Raphael, Two for the Road (1967) is a lesser-known (and less conventional) Stanley Donen effort. Audrey Hepburn supposedly had an affair with leading man Albert Finney during the shoot; if so, that helps to explain the solid on-screen chemistry between the two actors. Raphael's Oscar-nominated screenplay revolves around the various stages of a couple's relationship, from their initial meeting to marriage and its aftermath. Not necessarily in that order. A romantic comedy for adults, I find Two for the Road much superior to most of director Donen's better-known films (e.g., Singin' in the Rain, Funny Face). Audrey Hepburn, in particular, is outstanding as the youthful lovestruck woman who evolves into a disillusioned married matron. A must. The Aero Theatre is located at 1328 Montana Avenue, Santa Monica. The information below is from the American Cinematheque website. 1961, Paramount, 115 min, Dir: Blake Edwards. When Audrey Hepburn's girl-about-town Holly Golightly meets handsome nice guy George Peppard, she begins to gradually rethink her anything-goes, high-living lifestyle. Adapted from Truman Capote's bestselling romance by director Blake Edwards (THE PINK PANTHER, THE PARTY) and featuring what is arguably Henry Mancini's greatest score. 1967, 20th Century Fox, 111 min, USA, Dir: Stanley Donen. Director Stanley Donen and screenwriter Frederic Raphael tell the story of the ups and downs of a marriage via an ingenious, twisty structure more akin to film noir than romantic comedy in this offbeat character study. Albert Finney and Audrey Hepburn give two of the best performances of their careers as a husband and wife who can't stand each other - and can't stand to be apart. Audrey Hepburn Breakfast at Tiffany's photo via the American Cinematheque.